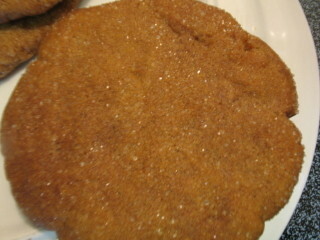 Ginger cookies are fabuloso! They are perfect autumn cookies. They are also good cookies for summer, winter, and spring. I just made some for my cat’s friend, Nicole. This recipe is one I found online last year and modified to suit my taste. 2. Mix flour, baking soda, spices, and salt. 3. In a separate, large bowl cream butter/earth balance together with sugar. Beat in egg/egg replacer, OJ, and molasses. 4. Gradually mix ingredients from step 2 into the wet mixture. 5. Cut up the crystalized ginger into whatever size pieces you please. Incorporate into batter. 5. Use heaping tablespoon to form big cookies. Roll cookie balls in a sugar and powdered ginger mixture. Place on ungreased cookie sheet and flatten a bit. 6. Bake for 10-ish minutes. Let cool. Eat. 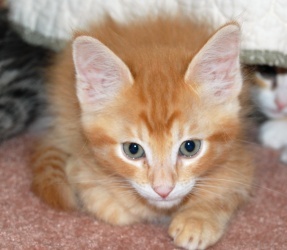 I want to surprise Kelly and adopt this ginger kitty. KK concurs. What, if not a picture of a kitty, is fodder for amateur blogging? The main thrust of our blog is supposed to be foodstuffs, but we will throw in kitties from time to time, along with other KK & HilHil- esque goodness (e.g., stellar dance moves, extreme makeover tips, quotable quotations). In the meantime, I’m waiting for this little guy’s foster mom to call me. He can’t be adopted until he weighs 2 pounds. Get fatter, kitty! I want you!